A member of the enslaved Banik race, Stark was cruelly expermimented on by Scorpius, toward whom Stark still harbors a pathological hatred. Stark has incredible powers of healing and mental abilities on par with those of Zhaan, whose death has left him grieving and alone in the galaxy. A member of the enslaved Banik race, Stark has the ability to ease pain and suffering of others. This trait, inherent to the Stykera (a particularly special breed of Banik) made him a highly sought-after test subject for Scorpius' Aurora Chair. 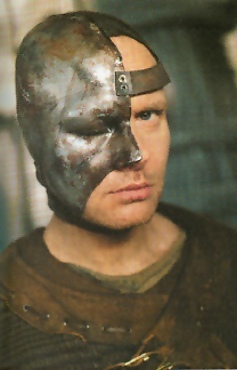 Stark helped John Crichton survive the horrors of the Aurora Chair and together the both of them escaped from Scorpius' Gammak Base ("Nerve" and "The Hidden Memory"). Stark returned to Moya and developed a special relationship with Zhaan, both of whom are able to use their specific mental powers to communicate extraverbally. Stark's relationship with Zhaan soon grew intimate on more than just a physical level. The two shared a spiritual affinity, and hoped to spend their lives together. Consequently, after Zhaan's death ("Self-Inflicted Wounds, Part 2: Wait for the Wheel") Stark became depressed and mentally unstable. Though he remained a productive member of the crew for some time, he began claiming that he could hear Zhaan's voice guiding him from "the other side." ("The Choice"). Eventually, he set out on his own to search for his beloved — a quest perhaps only he could successfully complete, thanks to his close spiritual connection to the realm of the dead. This page has been visited times since September 8, 2002.